A common question many patients have is when to do ice versus when to do heat. The answer to this really depends on the specific injury. Whether it is the arm, leg, neck or back there is a very simple question that can be answered to help determine how you can help take care of the pain. The big question is, do you know when you hurt it? Generally, acute injuries have a date or event that caused the injury. This includes things like a motor vehicle accident, sports injury or broken bone. These are events a physical therapist can point to as a cause for the current pain that you are experiencing. For these types of injuries, ice will generally give you the greatest benefit. For chronic injuries, we are dealing with an injury that has been ongoing for several months or years. These injuries have long surpassed their acute injury process and will now best respond to heating. Heat tends to relax chronic inflamed or aggravated tissue leading to general relief. Whether it is ice or heat a general rule to follow is to put on the pack for approximately 20 minutes at a time. Twenty minutes is roughly the maximum time frame to achieve therapeutic benefit for your body. After twenty minutes, allow yourself one hour before applying the pack again. You can apply the pack for as many sessions as you would like as long as you are allowing yourself a break in-between sessions. It’s also a general rule to avoid switching between ice and heat for the same injury. ACUTE: Generally sudden onset of pain lasting <6 weeks. Pt may experience some swelling that progresses within hours of initial injury or first notice of pain. CHRONIC: Generally lasting greater than three month. Mechanism of Injury can be known or unknown. Pain can be minimal to severe with swelling also generally lasting for several weeks at a time. **These are general statements concerning rules for ice vs. heat. Should you have any questions or require treatment for a condition. Please see your doctor prior to the use of a treatment modality you are not comfortable with using. Dr. Brittany Wright, DPT, joined the OCH team in 2017. She is available to see patients Monday-Friday at the OCH Evergreen Clinic in Springfield, Missouri. 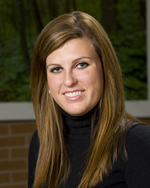 Brittany can provide pediatric and adult physical therapy services. She received her education from Southwest Baptist University in Bolivar, Missouri. To contact the OCH Evergreen Clinic to schedule an appointment with Brittany, call the office at 417-823-2900. Here are 10 fun and inexpensive play ideas to promote fine and gross motor skills, strength, balance, and coordination in children. Get to the Park: What kid doesn’t love to go to the park? Playground equipment provides an excellent opportunity to work on strengthening with all of the climbing that has to be done. Make a Hopscotch Course: Draw out a course with chalk on an asphalt or concrete surface. Have your child help draw the course to promote fine motor skills and let them “decorate” it to encourage artistic expression. Jumping is a great activity for kids and hopscotch helps with balance and coordination. Videogames, What? : In today’s world of DS’s and Play Stations, a lot of kids don’t know how to have fun with out a controller. Go old school and play games like “Mother May I?,” “Red Light, Green Light,” and “Simon Says.” These are great for learning to follow directions as well as encouraging motor skills. Hoola Hoop: Nothing works on coordination more than trying to spin a hoop around your waist! Mix it up a little and try have your child spin it around their arms, or for older kids, spin it around one foot while jumping over it with the other. Make an Obstacle Course: You can find all kinds of things around the house to use in an obstacle course. Jump ropes, step stools, brooms, books, toys, tunnels, pillows, etc. can all be used to make an obstacle course. Incorporate activities like jumping, standing on one foot, crawling over, under, and around objects, walking on a line, even push ups and sit ups. Make it even more fun by playing follow the leader or timing how long it takes to get through. Be an Artist: Encourage fine motor skills by drawing with sidewalk chalk or take a coloring book outside and have your child lay on their tummy on a blanket. Tummy time is very important for babies, but is also important for toddlers. Have a Zoo in the Backyard: Ok, not really, but have your kids crawl around the backyard like different animals! Do a crab walk, bear crawl, snake slither, frog hop, bunny hop, flamingo stance, any kind of animal. Make a game out of this; yell out different animal names, hold up signs, etc. Have a Ball: Ball skills are important for hand-eye coordination. Have balls of different sizes available. Throw at targets, play catch, throw into baskets, play kickball, use empty water/pop bottles as bowling pins and knock them down by rolling the ball toward them. Play Tug of War: This is great for upper body strength and tons of fun for kids! Have Fun and be Safe: Kids have a great imagination, if you can provide them with props and a few ideas, they will usually think of games to play on their own. Just make sure to get them up off the couch and play! As always, safety is always important, so keep a close eye on the kiddos! Content provided by Jennifer Witt, DPT. Jennifer works at OCH/Advantage Therapy in Springfield, Missouri and at OCH Christian County Clinic in Nixa. She received both her Bachelor of Science in Psychology and Doctorate in Physical Therapy from Missouri State University. She has experience in inpatient, outpatient, home health and pediatric settings. Her primary interest in physical therapy is pediatrics, specifically the 0-3 age group covering a variety of diagnoses. 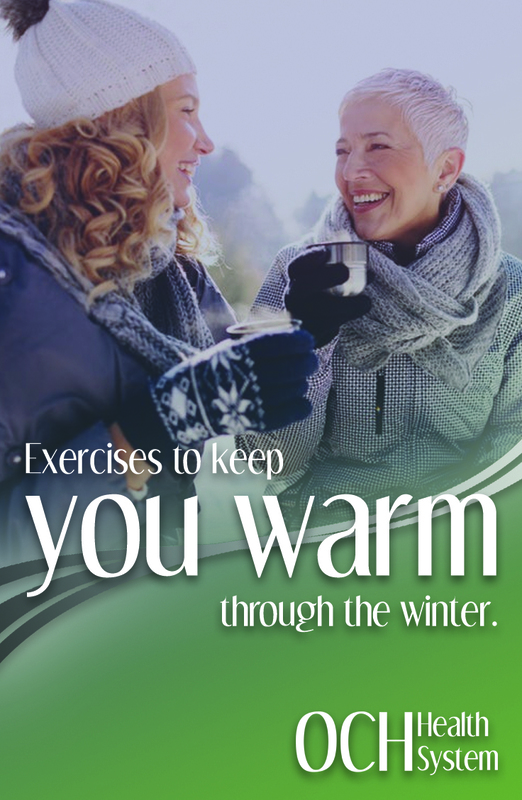 To contact Jennifer, call OCH/Advantage Therapy at (417) 777-4749. For more information about OCH/Advantage Therapy visit www.advantagetherapyonline.com. Push-ups may be a pain, but don’t eliminate them from your workout routine just yet! Not only do they increase upper body strength, but push-ups also reinforce the core including the back, abdominal, and hip stabilizers (if done in full plank position). Push-ups also increase muscle tone which helps burn more calories even when you are at rest. Additionally, they help strengthen the shoulder stabilizing muscles, which can prevent shoulder injuries down the road. Your body should be lifted by your arms. Do not compensate with other areas of the body– like using your stomach to lower your body. No swaying of the hips as you perform the push-up. Keep your body in a straight line. Push-up #2: To perform a modified version of the push-up, you have a few options. The first is the most commonly known: perform the push-up but keep your knees on the ground. Keep your hips in line with your body– do not bend at the hips! Push-up #3: Another option is to hold the plank position without the actual push-up. You are still getting arm and core strengthening with this exercise! You can complete both #2 and #3 to get the full benefit of the push-ups. Push-up #4: This can be performed for people who can almost complete a full push-up or people who can complete push-ups and want extra strengthening. Slowly lowering is called eccentric muscle control—muscle strengthening occurs more quickly with eccentric muscle control. So– always complete exercises with a slow and controlled speed for the most benefit! Push-ups require a strong line from the head to the feet. This requires muscles to work throughout the entire body. Although sit-up and crunches are good for toning the abdominal muscles, maintaining a strong core with all exercises is so important because it mimics what we all do everyday– stabilize our core while lifting, reaching, and moving! It is important to have a strong core to prevent injury during daily work and home tasks. Make sure that your “plank” position is strong and you feel like someone could push down lightly on your shoulders, hips, or back and you would not break this position. Rainy weather makes us all want to forgo the gym and pop in a movie complete with pop corn, soda and leftover candy from the holidays (you couldn’t throw it out, could you?). But that’s no excuse! We all know that fitness is good for us physically; it reduces stress and keeps us at a healthy weight. But sometimes it can be hard to know where to start and how to progress your fitness level. Fitness includes many areas: cardiovascular/respiratory endurance, stamina, strength, flexibility, power, speech, agility, balance, coordination and accuracy. We have the ability to increase any of those areas! But, who has time? Here are a few short workouts at home that require little to no equipment. Everything can be modified so that all fitness levels can increase in just minutes a day. Note: Before starting any of these listed below, check with your doctor to make sure that your heart is healthy enough for exercise. If you have knee pain, check with your physician before completing this exercise. Background: I love box squats because the nature of the exercise makes your body perform the squat correctly. I believe the most important exercise to do regularly is the squat. This variation of the squat can be performed at home and all you need is a stable chair. This is also an exercise that beginners and athletes can perform to strengthen knee stabilizing muscles and control at the bottom of the squat. To perform: Start with feet close to chair or surface you are sitting on to. The chair should rest about the height of your knees. Pull your arms parallel to the floor. Lower your hips and sit them as far back as possible. Keep your back straight and weight on the heels. Look straight in front of you and keep your arms up and parallel to the floor. Once fully seated, stand up while keeping the knees pointed outward with arms fully extended in front of you. Do not use your arms to push off you knees – make your legs do the work! Option # 1: Complete as many box squats in 5 minutes as possible. This one is easy to do during commercials or while watching the news. Option # 2: Complete 30 box squats, take a 2 minute break, then complete 20 box squats. After taking a final 2 minute break, complete 20 box squats. Done! Option # 3: If you want to progress the exercise, stop just before touching the seat and hover for a few seconds. Or, complete the exercise with dumbbells resting on the shoulders or a barbell on the back. Another way to increase the difficulty is to try 10 minutes of reps or 2 rounds of 5 minute reps with a short break in between. Squats work not only the legs; but the hips, back, abdominal muscles, and calves. It’s a while body workout with one easy movement. Keeping your arms raised maintains correct positioning of your back while also working the shoulder and arm muscles. Building muscle will burn more calories throughout the day, even when you are not being active. Toning the muscles that support the joins will help decrease pain in the knees, hips, back and help prevent injuries down the road.